Canadian musician Neil Young is scheduled to perform in Tel Aviv this upcoming July. As noted by the Palestinian Campaign for the Academic and Cultural Boycott of Israel (PACBI), Neil has been an "eager speaker in favor of the rights of the indigenous First Nations in Canada and has "vividly defended their right to resist oppression and exploitation." PACBI and the broader BDS movement, representing the absolute majority of Palestinian civil society, appeal to you to respect our strategy of resistance and uphold the highest standard of respect for the human rights of the indigenous oppressed Palestinians people. Brave decisions need to be taken in support of Palestinians exactly like you have supported the First Nations rights in Canada. Thus, the Palestinians call upon you to cancel your July 2014 performance in Tel Aviv. 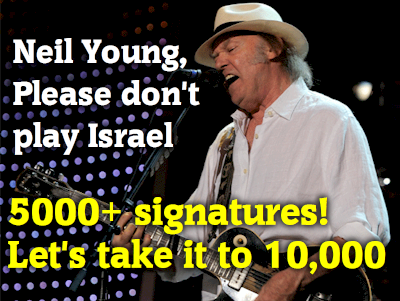 Take action below to send the message: Neil Young, Please Don't Play Israel! Sign and share this petition from Canadians for Justice and Peace in the Middle East. Click here to post this picture on your Facebook profile. Like "Neil Young, Tell Me Why You Would Play for Apartheid Israel." On Twitter? Click on Tweet Now to automatically send a tweet that includes a link to more information about the campaign. You can also post messages on his Facebook page. Watch and share Neil Young: Ohio-Palestine Mixtape from Independent Jewish Voices Canada. Last fall, Josh Ruebner, our National Advocacy Director, shared the exciting news of the publication of his first book, Shattered Hopes: Obama's Failure to Broker Israeli-Palestinian Peace. We are excited to announce that he will be visiting Pennsylvania Thursday, March 27 to Tuesday, April 1. We hope that you can join him at one or more of the events he'll be doing-- at Temple University in Philadelphia, PA, Friends of Sabeel Conference in Philadelphia, PA, Lutheran Theological Seminary in Gettysburg, PA, University of Pittsburgh in Pittsburgh, and Pennsylvania State University in State College, PA.
Below is the flyer for the events. Click here for the PDF version. If you plan on attending the Friends of Sabeel Conference, please register here. RSVP and invite your friends on Facebook to Temple University here, Lutheran Theological Seminary here and for more information, call 717-334-3871, University of Pittsburgh here, and Pennsylvania State University here. 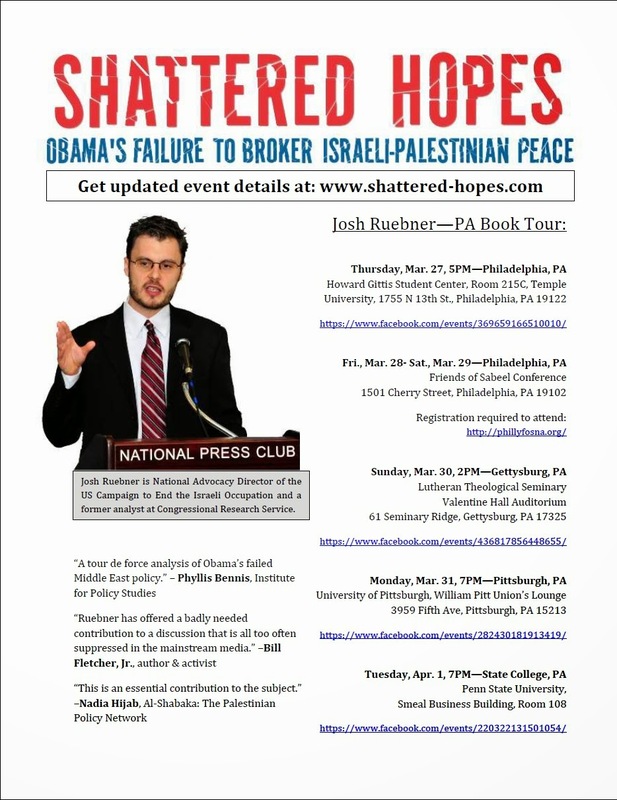 For additional information on Josh's spring book tour, see his website here. We look forward to seeing you there! We are excited to announce that he will be visiting the Triangle Area Tuesday, March 25 and Wednesday, March 26. We hope that you can join him at one or more of the events he'll be doing-- at Church of Reconciliation (USA) in Chapel Hill, NC, Meredith College in Raleigh, NC, and University of North Carolina, Chapel Hill in Chapel Hill, NC. RSVP and invite your friends on Facebook to Church of Reconciliation (USA) here, Meredith College here, and University of North Carolina, Chapel Hill here. We are excited to announce that he will be visiting Atlanta, GA Sunday, March 23 and Monday, March 24. We hope that you can join him at one or more of the events he'll be doing-- at Central Presbyterian Church in Atlanta, GA, North Decatur Presbyterian Church in Decatur, GA, Agnes Scott College in Decatur, GA, and Oakhurst Baptist Church in Decatur, GA.
Below is a flyer for the events. Click here for the PDF version. RSVP and invite your friends on Facebook to the events at Central Presbyterian Church here, North Decatur Presbyterian Church here, Agnes Scott College here, and Oakhurst Baptist Church here.